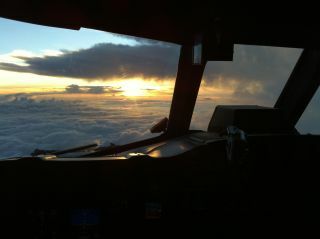 The sunrise west of (then) Hurricane Leslie this morning (Sept. 7, 2012) as seen from NOAA's P-3 Orion aircraft. Manned and unmanned aircraft are flying into Tropical Storm Leslie to keep tabs on the storm, which was recently downgraded from hurricane strength and is churning in the Atlantic Ocean north toward Bermuda. NASA launched an unmanned aircraft today (Sept. 7) to fly over Leslie. The U.S. Air Force Reserve's famed Hurricane Hunters have also gotten in on the action, with flights of their colossal WC-130J prop planes. Meanwhile, National Oceanographic and Atmospheric Administration pilots spied on Leslie from the organization's Gulfstream-IV aircraft. All of these missions are collecting data that should help scientists better understand how hurricanes and tropical storms form and intensify, and improve hurricane forecasts. NASA's unmanned aircraft, known as a Global Hawk, spent 10 hours collecting data on Leslie after taking off from Edwards Air Force Base, Calif., and landing at NASA's Wallops Flight Facility on Wallops Island, Va., this morning. The flight is part of a month-long mission in which two Global Hawks will fly over hurricanes and storms off the East Coast. Scientists still don't fully understand how hurricanes intensify because of the complicated physics involved and the difficulty of gathering data inside violent storms. Furthermore, there are only so many storms that can be studied, and they form under a wide variety of conditions, according to NASA. Global Hawks can stay in the air for as long as 28 hours and fly over hurricanes at a height of more than 60,000 feet (18,288 meters). They're operated by pilots in ground control stations at Wallops and Edwards Air Force Base. The Hawks will measure winds, temperature, water vapor, precipitation and aerosols from the surface to the lower stratosphere, to get a better portrait of what's going on inside the clouds. The Global Hawks also contain an instrument capable of measuring cloud structure and winds, providing a three-dimensional view of the storm.